Background : Before obturation, various endodontic solutions are used as a final rinse. These solutions might affect the bond strength of Resilon-Epiphany system. The aim of this study was to evaluate the effect of NaOCl (5.25%), chlorhexidine CHX (2%), EDTA solution (17%), and BioPure MTAD on push out bond strength of Resilon-Epiphany system. Materials and Methods : Seventy-five human premolar roots were prepared and divided on the basis of final endodontic solution rinse. The canals were obturated with Resilon-Epiphany system. All samples were restored using a fiber post system and indirect composite crown. The samples received 150 000 cycles of mechanical loading. Push out bond strength was performed in the apical third of root having Resilon obturation. Results and Conclusions : Different endodontic solutions tested, did not affected the push out bond strength of Resilon-Epiphany obturation system. The chemo-mechanical debridement is followed by a three-dimensional obturation of root canal space. Traditionally gutta-percha in combination with various sealers is used. The system lacks a chemical bonding with the root canal dentin walls. , Recently, a thermoplastic synthetic polymer resin-based root canal filling material ResilonTM (EpiphanyTM, Pentron Clinical Technologies, Wallingford, CT, USA) has been introduced. The resin matrix is composed of Bis-OMA, ethoxylated Bis-OMA, UDMA, and hydrophilic difunctional methacrylates. This system utilizes a dual cured resin system (EpiphanyTM) as sealer, which provides a chemical bond with dentin walls as well as Resilon cones. , The use of Resilon system creates a "Monoblock" between root canal dentin and root-filling material, thus increasing the root fracture resistance and decreases the microleakage. However, some authors have stated that the push out bond strength of Resilon point and Epiphany sealer to intraradicular dentin was less than gutta-percha point and conventional sealer. , Resilon system gains its bonding via formation of resin--dentin tags. For this purpose, a self-etching primer is used, which in combination with resin sealer forms intraradicular hybrid layer. For a successful treatment, a strong bond between obturating material and dentin is needed. Poor bonding at these interfaces will lead to debonding, microleakage, and eventual failure. Various endodontic solutions are used as a final flushing agent before initiating root canal obturation. After a final flushing with a chemical irrigant, some amount of the irrigating solution may remain in the root canal space, which may affect the resin impregnation and subsequent hybrid layer formation. The present study evaluated the effect of NaOCl (5.25%), CHX (2%), EDTA solution (17%), and BioPure MTAD on push out bond strength of Resilon obturation system and Epiphany sealer under cyclic loading. Seventy-five human uniradicular mandibular premolar teeth, extracted for orthodontic or periodontal reasons, without caries or restoration on the cervical third, were used in this study. The teeth were decoronated and the root length was standardized to 16 mm. The roots were embedded in acrylic moulds with epoxy resin liner to simulate periodontal ligament, such that 3 mm of root surface was exposed. The root canals were then manually prepared till size #50 using a balanced force technique. The canals were irrigated between change of each, alternatively delivering 10 ml of sodium hypochlorite (5.25%) and EDTA solution (17%) with a 27-gauge needle. The canals were flared using a step-back technique in 1-mm increments to a size 80 file. The specimens were divided into five groups on the basis of final irrigating solution used. Group I received a final flush of 10ml of sodium hypochlorite (5.25%) over a period of 3 min. Group II---EDTA solution (17%), Group III---BioPure MTAD, Group IV---Chlorhexidine (2%), and Group V (control)---distilled water. The canals were dried with absorbent paper points of appropriate size. Epiphany self-etching Primer was applied in the canals with the help of a suitable micro brush and excess amount was removed with the help of absorbent paper points. Epiphany sealer was mixed according to manufacturers recommendations and placed in the canal with the help of Resilon master point. The selected master point was coated with sealer and gently seated at the working length. Lateral compaction was performed using digital spreader (NTD11T, Brasseler, Lemgo, Germany). Accessory medium-fine Resilon points coated with sealer were laterally compacted into the canal, until they could not be introduced more than 3 mm into the root canal. The excess material was seared off and compacted with a plugger (Premier Dental Products) 1 mm below the canal opening. The coronal surface was light cured for 40 s. The canal entrances were sealed with a noneugenol temporary filling material (Cavit-G 3M ESPE). The specimens were stored at 100% humidity at 37 °C for 7 days. The specimens were restored using a double-tapered fiber quartz post system (D.T. Light- Post, Bisco). Standardized post spaces were prepared to a depth of 10 mm, using the manufacturers' corresponding post drill system. After post space preparation, canals were rinsed with distilled water and dried it with #60 absorbent paper points. Canals were etched with 35% phosphoric acid for 30 s. Canals were washed with 10 ml of distilled water. Excess water was removed with # 60 absorbent paper points. A multiple-bottle, total-etch adhesive system (All Bond 2 system, Bisco, Schaumburg, IL, USA) was used. A mixture of Primer A and Primer B (All Bond 2 system) was applied and excess material was removed with a Cavi-tip brush. Pre-bond resin (All Bond 2 system) was applied and excess was removed with brush. For post-cementation, A and B pastes of the resin cement Duolink (Bisco, Schaumburg, IL, USA) were measured and mixed. The cement was applied to the post and the root canal was filled with cement with a Lentulo no. 40 spiral (Dentsply Maillefer, Ballaigues, Switzerland). The samples were cured for 40 s. Core build up was done with Light-Cure composite resin core material (Bisco, Schaumburg, IL, USA). A 2-mm-ferrule preparation was given and indirect composite crowns were fabricated with SR Adoro® (Ivoclar Vivadent) and Lumamat 100 furnace (Ivoclar Vivadent). The specimens were placed in a metallic base at a 45° angle, so that a 1.5 mm stylus at the upper rod of the cycling machine will induce load pulses of 60 N, at a frequency of 5 Hz. Samples were subjected to cyclic loading of 150 000 cycles at 60 N (simulating 6 months of oral masticatory stresses). Two millimeter thick serial slabs were sectioned from the apical 3 mm of each specimen by means of an Isomet saw under water lubrication. Push out strength was tested with the help of a 0.70 mm thick cylindrical stylus attached to a testing apparatus of Universal Instron testing machine (Zwick GmbH and Co, Germany). The samples were stressed to failure at a crosshead speed of 0.5 mm/min. The push-out bond strength was obtained with the help of a previous study. The findings were recorded onto a Microsoft Excel sheet [Microsoft Office Excel 2003] for statistical evaluation, using the program SPSS 11.5 for Windows [SPSS Inc., Chicago, IL, USA]. A descriptive analysis of microtensile bond strength was done for all groups [Table 1]. Results were presented as minimum, maximum and mean ± standard deviation. Since the variables in this study were following the normal criteria, one-way analysis of variance (ANOVA), was used for comparing these variables among the four groups. The significance between the individual groups was calculated, using a post-hoc ANOVA test. The control group had a punch out bond strength (S) of 2.981 ± 0.5623 MPa. The 'S' of CHX, MTAD, EDTA, and NaOCl groups was 2.881 ± 0.223 MPa, 3.241 ± 0.4412 MPa, 3.228 ± 0.3781 MPa, and 2.831 ± 0.3124 MPa, respectively [Figure 1]. There was no statistically significant difference between CHX, MTAD, EDTA, NaOCl and control groups (P > 0.05). Successful root canal treatment is achieved by three dimensional obturation of the root canal system after through chemo-mechanical debridement. The obturating material should provide a fluid tight seal, both apically and coronally along with all accessory canal system. , Resilon system with Epiphany sealer was introduced in endodontics with an attempt to increase the bonding between radicular dentinal walls and obturating materials. , Resilon system achieves its chemical bonding via formation of hybrid layer with dentinal tubules. Any variable which affect the adherence of sealer with root canal dentin will have a negative effect on the bonding of Resilon system. Before obturation, various endodontic solutions are recommended as a final flush. These solutions have a chemical as well as mechanical action on the smear layer and dentinal walls. , NaOCl with an alkaline pH of 9--10.5 effectively removes the organic portion,  while Ethylene diamine tetraacetic acid (EDTA) is most commonly used as a chelating agent. , BioPure MTAD consists of tetracycline, citric acid and detergent (Tween 80). CHX is mainly used because of its antibacterial properties. However, any positive benefit of the final rinse with these solutions might get negated if these solutions affect the bonding of resin sealer with dentinal tubules. The present study evaluated the effect of various endodontic solutions used as a final flush, on the push out bond strength of Resilon obturating system under cyclic loading. The samples were divided on the basis of final rinse received i.e. NaOCl, EDTA, MTAD, CHX, and control group (distilled water). The restoration and the teeth are unavoidably subjected to various masticatory stresses. , These stresses may negatively affect the resin dentin bond. Therefore to simulate oral conditions, samples were subjected to cyclic loading of 150 000 cycles at 60 N, which simulated 6 months of clinical usage. The bond strength of control group was 2.981 ± 0.5623 MPa. The value was less than reported literature. The possible explanation may be the effect of cyclic loading on the seal of resin-dentin interface. Also the mechanical post space preparation may have affected the resin dentin bonds. The value of push out bond strength was 2.881 ± 0.223 MPa, in samples received a final rinse with chlorhexidine gluconate. Chlorhexidine is a broad spectrum antiseptic and is widely accepted as an endodontic irrigant. Various studies have demonstrated that chlorhexidine application, prior to acid-etching in etch and rinse adhesives, have no adverse effects on immediate composite-adhesive bonds in dentin,  enamel,  or with resin-reinforced glass-ionomer cement  Recent studies have examined the use of chlorhexidine after acid-etching, demonstrating initial bond strengths comparable with those of the controls. ,, Also some in vitro, as well as an in vivo study  demonstrates preservation of hybrid layers with chlorhexidine treatment after acid-etching. However, it is still controversial whether the application of a chlorhexidine solution influences the effectiveness of a self-etching adhesive such as Epipany primer. Epipahny primer contains a sulphonic acid terminated functional monomer, HEMA, water, and polymerization initiator. The weak sulphonic acid dissolves the smear layer and incorporates it into the mixture as it demineralizes dentin and encapsulates collagen fibers and hydroxyappetite. In the present study, the chlorhexidine gluaconate rinse did not adversely affect the push out bond strength of Resilon--Epiphany system. As discussed earlier, NaOCl can effectively remove organic portion. The use of NaOCl is recommended during irrigation of infected root canals. Recently, it has been suggested that NaOCL irrigation can negatively affect the elastic modulus and flexural strength of dentin. In the present study, NaOCl irrigation did not affected the push out bond strength. MTAD and EDTA increased the push out bond strength to 3.241 ± 0.4412 MPa and 3.228 ± 0.3781 MPa. Though the increase was statistically insignificant, but there was generalized trend in increase in bond strength. EDTA has six potential sites (four carboxyl groups and two amino groups) available to bond with calcium to form highly stable bonds. , Due to its ability to form complexes with calcium ions, EDTA is commonly used to remove the smear layer in nonsurgical endodontic treatment. Because of the ability of EDTA and MTAD to remove smear layer, they might have increased the penetration of resin tags and increased the bond strength of Resilon system. Under the limitations of this in vitro study, it can be concluded that a final rinse with CHX, NaOCl, MTAD, or EDTA solution have not any effect on the bond strength of Resilon--Epiphany system. 1. Gulabivala K, Patel B, Evans G, Yuan-Ling NG. Effects of mechanical and chemical procedures on root canal surfaces. Endod Topics 2005;10:103-22. 2. Soares JA, Leonardo MR, Silva LA, Tanomaru Filho M, Ito IY. Effect of biomechanical preparation and calcium hydroxide pastes on the anti-sepsis of root canal systems in dogs. J App Oral Sci 2005;13:93-100. 3. Shah N, Logani A, Bhaskar U, Aggarwal V. Efficacy of revascularization to induce apexification/apexogensis in infected, nonvital, immature teeth: A pilot clinical study. J Endod 2008;34:919-25. 4. Bui TB, Baumgartner JC, Mitchell JC. Evaluation of the interaction between sodium hypochlorite and chlorhexidine gluconate and its effect on root dentin. J Endod 2008;34:181-5. 5. De-Deus G, Soares J, Leal F, luna AS, Fidel S, Fidel RA. Similar glucose leakage pattern on smear-covered, EDTA-treated and BioPure MTAD-treated dentin. J Endod 2008;34:459-62. 6. Hulsmann M, Heckendorff M, Lennon A. Chelating agents in root canal treatment: Mode of action and indications for their use. Int Endod J 2003;36:810-30. 7. Collins J, Walker MP, Kulild J, Lee C. A comparison of three gutta-percha obturation techniques to replicate canal irregularities. J Endod 2006;32:762-5. 8. Wu MK, De Gee AJ, Wesselink PR, Moorer WR. Fluid transport and bacterial penetration along root canal fillings. Int Endod J 1994;26:203-8. 9. De Moor RJ, Martens LC. Apical microleakage after lateral condensation, hybrid gutta-percha condensation and Soft-Core obturation: An in vitro evaluation. End Dent Traumatol 1999;15:239-43. 10. Raina R, Loushine RJ, Weller RN, Tay FR, Pashley DH. Evaluation of the quality of the apical seal in Resilon/Epiphany and Gutta-Percha/AH Plus-filled root canals by using a fluid filtration approach. J Endod 2007;33:944-7. 11. Bodrumlu E, Tunga U. apical leakage of resilon obturation material. J Contemp Dent Pract 2006;7:45-52. 12. Hammad M, Qualtrough A, Silikas N. Effect of new obturating materials on vertical root fracture resistance of endodontically treated teeth. J Endod 2007;33:732-6. 13. Ureyen Kaya B, Keçeci AD, Orhan H, Belli S. Micropush-out bond strengths of gutta-percha versus thermoplastic synthetic polymer-based systems - an ex vivo study. Int Endod J 2008;41:211-8. 14. Jainaen A, Palamara JE, Messer HH. Push-out bond strengths of the dentine- sealer interface with and without a main cone. Int Endod J 2007;40:882-90. 15. Aggarwal V. An in vitro evaluation of effect of ionizing radiotherapy on push-out strength of fiber posts under cyclic loading. J Endod 2009;35:695-8. 16. Aggarwal V, Logani A, Jain V, Shah N. Effect of cyclic loading on marginal adaptation and bond strength in direct vs. indirect class II MO composite restorations. Oper Dent 2008;33:587-92. 17. Leonard JE, Gutmann JL, Guo IY. Apical and coronal seal of roots obturated with a dentine bonding agent and resin. Int Endod J 1996;29:76- 83. 18. Perdigão J, Denehy GE, Swift EJ Jr. Effects of chlorhexidine on dentin surfaces and shear bond strengths. Am J Dent 1994;7:81-4. 19. Filler SJ, Lazarchik DA, Givan DA, Retief DH, Heaven TJ. 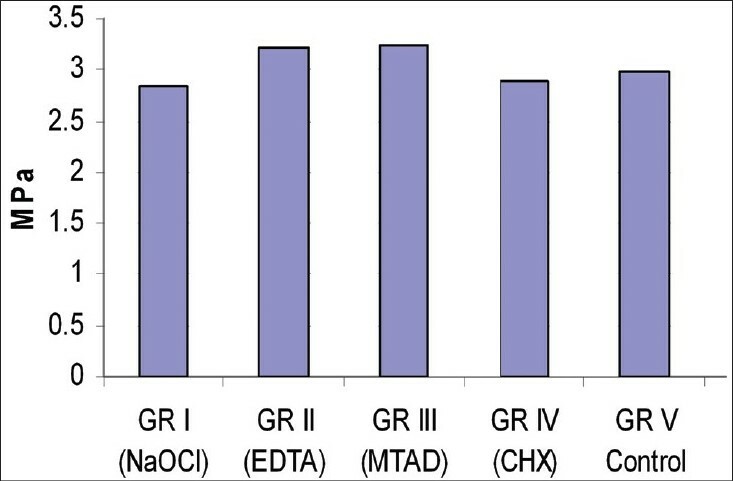 Shear bond strengths of composite to chlorhexidine-treated enamel. Am J Dent 1994;7:85-8. 20. Cunningham MP, Meiers JC. The effect of dentin disinfectants on shear bond strength of resin-modified glass-ionomer materials. Quint Int 1997;28:545-51. 21. Soares CJ, Pereira CA, Pereira JC, Santana FR, Prado CJ. Effect of chlorhexidine application on microtensile bond strength to dentin. Oper Dent 2008;33:183-8. 22. Brackett WW, Tay FR, Brackett MG, Dib A, Sword RJ, Pashley DH. The effect of chlorhexidine on dentin hybrid layers in vivo. Oper Dent 2007;32:107-11. 23. Korkmaz Y, Baseren M. Effect of antibacterial varnishes applied to root dentin on shear bond strength of tooth-colored restorative materials. Oper Dent 2008;33:65-71. 24. Hebling J, Pashley DH, Tjaderane L, Tay FR. Chlorhexidine arrests subclinical degradation of dentin hybrid layers in vivo. J Dent Res 2005;84:741-6. 25. Sim TP, Knowles JC, Ng YL, Shelton J, Gulabivala K. Effect of sodium hypochlorite on mechanical properties of dentine and tooth surface strain. Int Endod J 2001;34:120-32. Patil A, S. and Dodwad K, P. and Patil A, A.
Vinothkumar, T.S. and Rubin, M.I. and Balaji, L. and Kandaswamy, D.